It's rumored that the Secretary of State's office is re-auditing Danbury's November election results. As I reported last year, Danbury's third ward was selected to be audited by random in an effort to make sure the new optical scanning machines worked properly. I'll contact the SOTS on Monday and confirm what's going on (if anything). Seems like running around in DC took more out of me than I realized and I STRONGLY don't recommend anyone walk around our nation's capitol in freezing conditions for 10 hours. Since I installed my new logic board into my laptop, I'll be able to produce my video footage I shot this week. I'll probably have everything posted tomorrow so stay tuned. 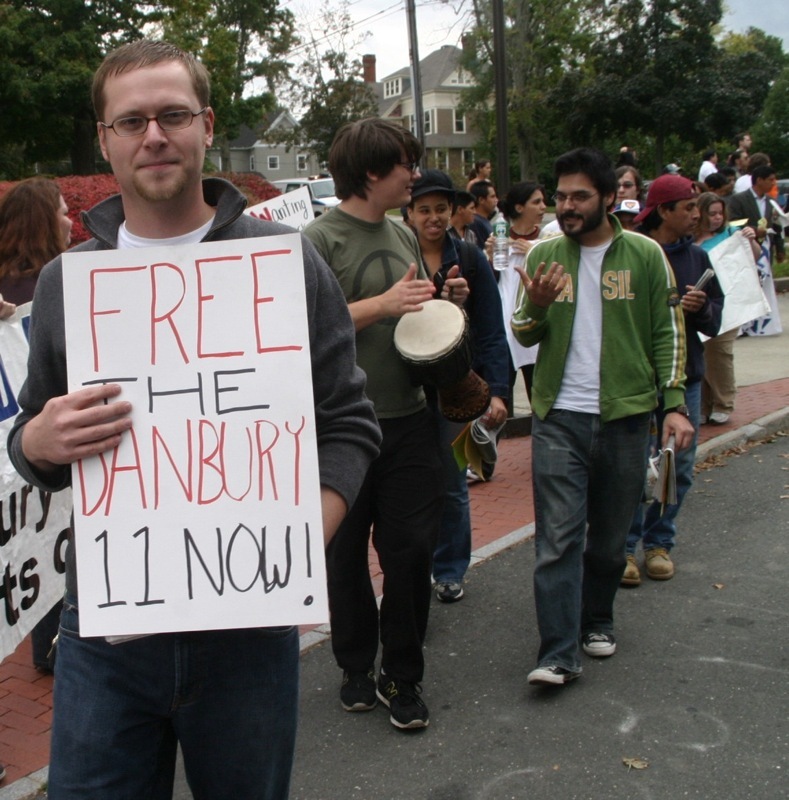 Are we getting the real story about the financial shape of Danbury? The town of Ridgefield is facing tough times with a $1.1 million deficit and layoffs looming, First Selectman Rudy Marconi told a crowd of 25 attending his State of the Town address Thursday morning. While only seven foreclosures have been recorded in the town in 2008-09 so far, there was still was a $2.2 million hit to the town employees pension fund, of which $1 million was recovered. With layoffs coming at IBM and more layoffs anticipated in the second quarter from General Electric, Marconi is concerned that Ridgefield residents may be affected by job loss. Conveyance taxes are down to $15 million from the usual $45 million seen in a healthy economy. And it looks like Fairfield County make take a harder hit from state cuts in ECS (Education Cost Sharing) reimbursements than the rest of the state, Marconi said. 1. The state deficit figure has gone up from 350 million to aprox 1 BILLION dollars! 2. Bethel is out 909,000 dollars in revenue this fiscal year. 3. There are still many unanswered questions regarding the city's pension that is raising serious alarm bells among those who understand the pension process. 4. There are still many questions surrounding the mayor's unilateral decision to ram 2.5 million dollars in questionable bonding proposals down the throats of the taxpayer's of the city without their approval. 5. The New London Day notes that the relentless winter weather costs is requiring towns and cities to spend more than expected. Just use logic here. Faced with these factors, shouldn't politicians and the press ask more questions about the city's financial shape? Why the silence? Where is the fact checking against what the mayor and director of finance stated so far about the shape of the city? Are we to believe that the seventh largest city is simply doing "okay" or is there more to the city's financial story than meets the eye? A number of bloggers from Connecticut made the trip to DC to see history in the making. While I'm downloading and working on by post on my experiences in DC, here's a sample of what's to come from one of the best videobloggers I know, Lon Seidman. I had a great couple of days in DC and of course brought my geek gear to document the journey. I posted a gallery on Flickr that you can find by clicking here. Blogging from DC right now and my feet are killing me from all the cold. Can't blog much since I really need to go to bed but I felt I just needed to express how incredible today was. If you missed this moment, you truly missed a moment in history that you will always regret. Since I'm not done with my blog on my entire journey to and from the big event in DC, I'm going to have my report on the big show until I get back and have a chance to process my video and photos. ...TV does this day NO JUSTICE as you'll understand once I share my images with everyone. What, you didn't think I would miss this inauguration did ya! Posting will be non-existent today as I'm frantically packing for my trip to D.C. to witness the swearing in of Barack Obama. ...and yes, I'm going to blog ALL about it. My first thing I have to do when I reach DC is get a handle on where the WiFI locations are and the best place to set up. There are MANY restrictions which wil lmake live blogging next to impossible unless you own a Blackberry. Since you can't carry any backpacks or camera bags, I'll basically be without a computer while at the ceremony BUT I will be shooting video, doing interviews, and taking photos (my coat has BIG pockets). Although it's still in the works, there is a possibility that my blog posts will be simulcasted over at the News-Times site (and I say possibility since I'm using a MUCH older Windows laptop and I'm still testing producing videos on it). After I get my bearings worked out, I have to attend the Netroots Nation "Yes We Can" party, which should be a blast since it's been a while since I've seen some of the national bloggers who were around during the Ned Lamont/Joe Lieberman primary. I'm sure I'll be shooting video there as well. Then it's an early night's sleep as I'll probably have to hit the Capitol around 6-7 AM and deal with the cold. Now, since there is going to be an estimated 4 million people down there, it's going to be next to impossible to find the people from New Hope Baptist Church who will be there also BUT if I can, I'll make sure to interview them. All in all, I'm VERY excited to participating in history in the making...but for now, I better get back to packing.